Schwarzenegger-fronted Celebrity Apprentice is going to be weird, right? Posted on: Sunday, March 20, 2016	by Eric - TV Geek Army "Revered Leader"
Maybe not quite as weird as the prospect of a President Trump, but still. Posted on: Wednesday, February 29, 2012	by Eric - TV Geek Army "Revered Leader"
Posted on: Monday, February 20, 2012	by Eric - TV Geek Army "Revered Leader"
I'm going to brazenly break down this season into tiers based on who I am rooting for straight out of the gate. Posted on: Thursday, April 7, 2011	by Eric - TV Geek Army "Revered Leader"
Meat’s meltdown aside, it’s nice to have... wait for it, a positive reason to tune into a competition-based reality show each week. Posted on: Thursday, March 24, 2011	by Eric - TV Geek Army "Revered Leader"
Posted on: Monday, March 14, 2011	by Eric - TV Geek Army "Revered Leader"
Posted on: Tuesday, March 8, 2011	by Eric - TV Geek Army "Revered Leader"
Posted on: Friday, December 10, 2010	by Eric - TV Geek Army "Revered Leader"
A rare non-live version of an Apprentice finale gets the live blogging treatment. 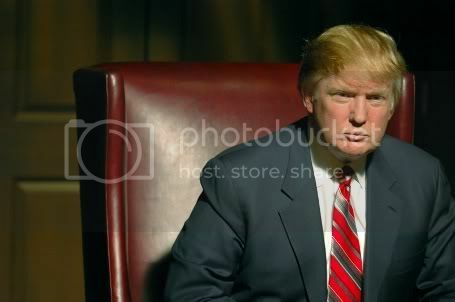 Posted on: Friday, October 29, 2010	by Eric - TV Geek Army "Revered Leader"
Posted on: Saturday, September 18, 2010	by Eric - TV Geek Army "Revered Leader"
A new cast, Donald Trump, "you're fired," and associated antics are back, this time in a long awaited non-celebrity edition. Posted on: Tuesday, May 25, 2010	by Eric - TV Geek Army "Revered Leader"
Is Bret Michaels the greatest of all the Celebrity Apprentice winners? You be the judge, America. Posted on: Sunday, May 23, 2010	by Eric - TV Geek Army "Revered Leader"
The new prognosis is that Michaels -- who we now know is indeed a finalist -- will be attending the Celebrity Apprentice live season finale. Posted on: Monday, May 10, 2010	by Eric - TV Geek Army "Revered Leader"
Posted on: Wednesday, May 5, 2010	by Eric - TV Geek Army "Revered Leader"
Posted on: Tuesday, April 27, 2010	by Eric - TV Geek Army "Revered Leader"
Posted on: Tuesday, April 20, 2010	by Eric - TV Geek Army "Revered Leader"
Posted on: Tuesday, April 13, 2010	by Eric - TV Geek Army "Revered Leader"
Posted on: Tuesday, April 6, 2010	by Eric - TV Geek Army "Revered Leader"
Posted on: Sunday, April 4, 2010	by Eric - TV Geek Army "Revered Leader"
Wherein we unwrap layers of exposure. Posted on: Tuesday, March 16, 2010	by Eric - TV Geek Army "Revered Leader"